Hills Prescription Diet ID Digestive Care Low Fat Dry Food for Adult Dogs is a complete and balanced low-calorie diet for the management of gastrointestinal related disorders, including pancreatitis and gastritis. 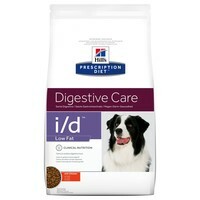 Made with highly digestible ingredients that provide your dog with a balance of essential nutrients, Hills I/D promotes the growth of beneficial bacteria in the gut and reduces digestive upset. Hills I/D Digestive Care also has a high content of electrolytes and essential antioxidants to support your dog’s overall health. My German Shepherd loves this food and really enjoys it compared to others. She is on this food for life and finding it on this site has been a blessing as it is much better value than getting it from my own vet. I live in Ireland and buying two bags for delivery works out cheaper than one bag from practically across the road.